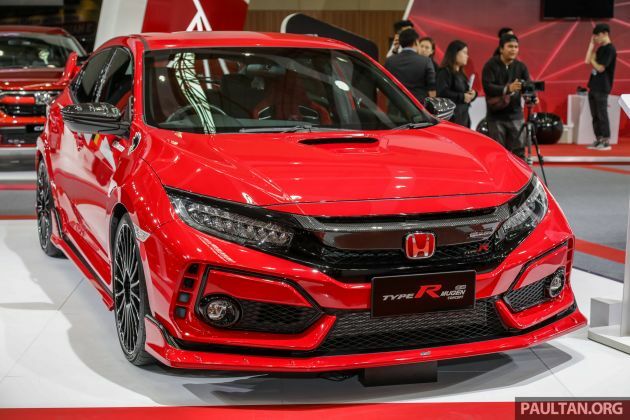 The FK8 Honda Civic Type R Mugen Concept that was seen at the Tokyo Auto Salon earlier this year is in town, the car making its first appearance in Southeast Asia at the 2019 Malaysia Autoshow, which begins today. The Malaysian show car is a little different than the TAS example, which was tagged as a Prototype – for one, it’s dressed in a striking Carnival Red exterior shade. There are also a few differences in kit. The car seen here wears a different rear spoiler, and where the TAS example had a twin outlet exhaust, it’s the usual three-tip configuration on the car here. A Mugen body decal set makes itself known, quite prominently. Inside, there’s one noticeable change – where the TAS car featured black Mugen bucket seats, this one has red sports seats with black accents, and adorned with Type R logos. Otherwise, it’s identical to what was seen in Tokyo. Exterior dress-up elements include a carbon grille garnish, complete with Mugen and Honda badges, a front lip spoiler, a rear under spoiler and side skirts. The car also gains carbon-fibre side mirror caps, new Mugen graphics for the LED tail lamps, a prominent rear spoiler and 20-inch multi-spoke, two-tone wheels with Continental Sport Contact 6 tyres. Interior revisions include carbon-fibre trim, which makes its way on to the door and dashboard panels, while the shift knob is wrapped in bright red leather, complete with Mugen script. Also to be found are sports mats and scuff plates. The primary idea being to showcase the car as a trial platform for aesthetic enhancements, there’s no mention of mechanical changes, and so the Type R’s 2.0 litre VTEC Turbo mill in the Japanese example should be putting out the usual 320 PS and 400 Nm. The Mugen kit remains in concept form, but should eventually make its way out into the market. When it does, Honda Malaysia says that there is a possibility that the styling pack might make its way here. Either way, I saw a lots of Chinese Civic FC owners on FB, show off their heavily mod Type R-like Civic FC, yet still cannot accept other people call it is a FAKE TYPE R FAKE DOG. fuhh, Ah Beng Spec turn up to 11! sales in Sunway will be affected..
Japanese cars had always been a lalabeng car. This just to show that it is shamelessly acknowledging it is a lalabeng car. Aiyo Honda! Overdone! Your designers don’t know when to stop using the Red Lipstick! Lol, correct, they’re CSC6 units. Thought it was like the TAS example. Thanks for the spot, and corrected. HM, where is our ketam facelift?? ?